Hansi Berg was the daughter of the Jewish actor Eugen Berg. In 1923 she met Hans Albers and she would become his most important partner, allthough he liked to mess around with other women. Initially she was protected from the nazi's by Albers' fame and popularity, but in 1935 Albers gave in and wrote to Goebbels that he had seperated from Hansi. She married the Norvegian citizen Erich Blydt but in 1938 she was forced to flee to Switzerland. From there she went to England. She was hoping in vain that Albers would follow her to England, but he stayed in Germany. Her father died in 1944 in Theresienburg. After the war was over she returned to Albers in 1946. Together they lived in Garatshausen at Lake Starnberg near Munich. Albers died in 1960 and when Hansi sold the estate to the state of Bavaria in 1971 she was allowed to continue living there. 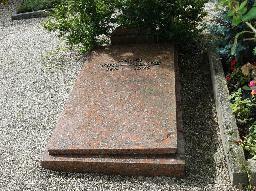 She died in 1975 and was buried in Tutzing. The grave of Hansi Burg at the Alte Friedhof, Tutzing.